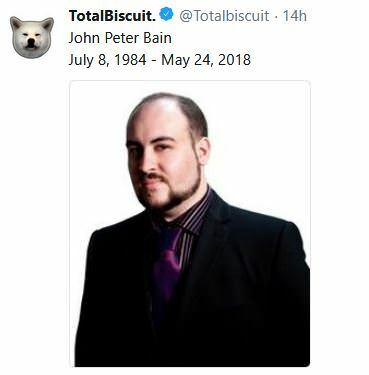 TotalBiscuit is a name most have heard of. Or John Peter Bain as he is actually called. He has been living with stage 4 cancer for a few years now. And a few weeks ago the made a post on reddit that his body was now immune to the treatment, and that he had accepted the end was not far off, and his work on his youtube channel would come to a stop with the exception of the podcast. He posted his last podacast 6 hours before he died "tho without him". The last 3 podcasts he did, he did sound different, and he talked way slower then he usually did. Tho for others he was more known in the E-sport world as a 1st class commentator. He has been doing Overwatch and Starcraft II events for years. Where he even owned and ran a team for SC2. His wife will now take over his channel as was said in the reddit post a few weeks ago. If she will keep the channel alive or not is not known atm. Saw this earlier today. Dam shame he produced a lot of great content over the years. I always used to value his opinion on games. So sad to read this after angry joe and yartzi(sp) TB was one of my fav reviews and always came across as sincere and unbiased plus he spoke real English unlike most YouTubers he will be missed and my heart goes out to his family and loved ones.